Now get One Stroke Bold Color with the new Nail Pops. Flaunt vibrant nails that look like they've just been through a pop manicure! The New Elle 18 Nail Pops Nail Color gives a glossy, fun color to your nails and with so many shades of nail colors to choose from there's one for every mood and occasion and all this in Just One Stroke. The Elle 18 Nail Pops are a collection specially designed for the excited you who needs new shades for every mood and occasion, be it a college party, or festival, there's always a nail pop for you. With 50 new shades to choose from, you will surely find your match. Elle 18 Nail Pops are designed to give you a long-lasting finish at just Rs.50. Buy your favorite, or maybe 2 right away! The range is big and wide from pinks, reds, mauves, and browns to funky colors like yellow, greens and blues. For a better finish, apply a second coat after the first has dried completely. Its chip resistant, long lasting. Elle 18 Nail Pops goes well with, Elle 18 Color Pops Matte & Eye Drama Kajal. How to apply: Apply a coat of your favorite Elle 18 Nail Pop all over your nails avoiding the outer edges and the surrounding skin. Be sure to apply two coats of nail polish for that salon-quality finish. Take your nail polish brush, dip it in the polish to create a thin layer. Then, swipe on the nail with three thin strokes with one in the middle and two on the sides. Once dried, you can apply your second layer of polish, using the same technique. 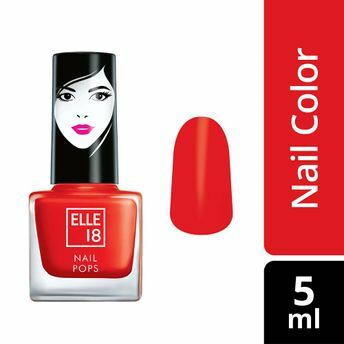 Alternatively, you can also find many more products from the Elle 18 Nail Pops Nail Polish range.